When it comes to used cars in Eden, NC our dealership is your destination! Our used car dealership has great options when it comes to used cars, trucks and SUVs. Find your pre-owned vehicle online. What are you waiting for? Dealer Warranty, Third Row Seating, 17" x 6.5" Aluminum Wheels, 2nd Row Buckets w/Fold-In-Floor, Power Liftgate, Quick Order Package 29R SXT. Clean CARFAX. Billet Silver Metallic Clearcoat 2014 Dodge Grand Caravan SXT FWD 6-Speed Automatic 3.6L V6 24V VVT $1000 price protection guarantee, Tri City serving greensboro, burlington, martinsville, danville and surrounding areas. Warranty on every used car in stock. Recent Arrival! Odometer is 11951 miles below market average! 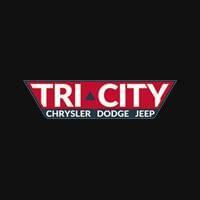 Tri City proudly serving Martinsville, Danville, Greensboro, Burlington, Winston Salem, Kernersville. We have the $1000 price protection guarantee along with the lowest administrative fee in the area with zero hidden fees. Come check out our competitive advantage, as well as our courtesy delivery service. One Owner, Dealer Warranty, Body Color Rear Bumper w/Gloss Black Step Pad, Gloss Black Side Roof Rails, Quick Order Package 24C Altitude Edition, Wheels: 17" x 6.5" Black Aluminum. Clean CARFAX. CARFAX One-Owner. Maximum Steel Metallic Clearcoat 2015 Jeep Patriot Altitude FWD CVT 2.0L I4 DOHC 16V Dual VVT $1000 price protection guarantee, Tri City serving greensboro, burlington, martinsville, danville and surrounding areas. Warranty on every used car in stock. Recent Arrival! Odometer is 26769 miles below market average! 22/27 City/Highway MPG Awards: * 2015 KBB.com 5-Year Cost to Own Awards Tri City proudly serving Martinsville, Danville, Greensboro, Burlington, Winston Salem, Kernersville. We have the $1000 price protection guarantee along with the lowest administrative fee in the area with zero hidden fees. Come check out our competitive advantage, as well as our courtesy delivery service. One Owner, Dealer Warranty, 17" x 7" Aluminum Wheels, Nav Capable! See Dealer For Details, Quick Order Package 24J, Roof rack: rails only. Clean CARFAX. CARFAX One-Owner. Brilliant Black Crystal Pearlcoat 2016 Jeep Cherokee Latitude FWD 9-Speed 948TE Automatic 2.4L 4-Cylinder SMPI SOHC $1000 price protection guarantee, Tri City serving greensboro, burlington, martinsville, danville and surrounding areas. Warranty on every used car in stock. Recent Arrival! Odometer is 5698 miles below market average! 22/31 City/Highway MPG Tri City proudly serving Martinsville, Danville, Greensboro, Burlington, Winston Salem, Kernersville. We have the $1000 price protection guarantee along with the lowest administrative fee in the area with zero hidden fees. Come check out our competitive advantage, as well as our courtesy delivery service. One Owner, Dealer Warranty, 17" Wheel Covers, 4.3" Touch Screen Display, Roof rack: rails only. Clean CARFAX. CARFAX One-Owner. Certified. Vice White 2018 Dodge Journey SE FWD 4-Speed Automatic VLP 2.4L I4 DOHC 16V Dual VVT $1000 price protection guarantee, Tri City serving greensboro, burlington, martinsville, danville and surrounding areas. Warranty on every used car in stock. Recent Arrival! FCA US Certified Pre-Owned Details: * Roadside Assistance * Warranty Deductible: $100 * Includes First Day Rental, Car Rental Allowance, and Trip Interruption Benefits * Powertrain Limited Warranty: 84 Month/100,000 Mile (whichever comes first) from original in-service date * Limited Warranty: 3 Month/3,000 Mile (whichever comes first) after new car warranty expires or from certified purchase date * Transferable Warranty * 125 Point Inspection * Vehicle History Tri City proudly serving Martinsville, Danville, Greensboro, Burlington, Winston Salem, Kernersville. We have the $1000 price protection guarantee along with the lowest administrative fee in the area with zero hidden fees. Come check out our competitive advantage, as well as our courtesy delivery service. One Owner, Dealer Warranty, 1 Yr Trial (Registration Required), 17" x 6.5" Aluminum Wheels, 5-Year SiriusXM Traffic Service, 5-Year SiriusXM Travel Link Service, 6.5" Navigation Group w/Uconnect, 6.5" Touchscreen Display, For Details Visit DriveUconnect.com, GPS Navigation, HD Radio, Quick Order Package 27E, Radio: Uconnect 6.5 Nav, Remote USB Port, SiriusXM Traffic, SiriusXM Travel Link, Uconnect Access. Clean CARFAX. CARFAX One-Owner. Certified. Solar Yellow 2017 Jeep Renegade Trailhawk 4WD 9-Speed 948TE Automatic 2.4L I4 MultiAir $1000 price protection guarantee, Tri City serving greensboro, burlington, martinsville, danville and surrounding areas. Warranty on every used car in stock. Recent Arrival! Odometer is 11102 miles below market average! 21/29 City/Highway MPG Chrysler Group Certified Pre-Owned Details: * Roadside Assistance * Transferable Warranty * 125 Point Inspection * Vehicle History * Includes First Day Rental, Car Rental Allowance, and Trip Interruption Benefits * Warranty Deductible: $100 * Powertrain Limited Warranty: 84 Month/100,000 Mile (whichever comes first) from original in-service date * Limited Warranty: 3 Month/3,000 Mile (whichever comes first) after new car warranty expires or from certified purchase date Awards: * 2017 KBB.com 10 Best All-Wheel-Drive Vehicles Under $25,000 * 2017 KBB.com 10 Coolest New Cars Under $18,000 * 2017 KBB.com 10 Most Awarded Brands Tri City proudly serving Martinsville, Danville, Greensboro, Burlington, Winston Salem, Kernersville. We have the $1000 price protection guarantee along with the lowest administrative fee in the area with zero hidden fees. Come check out our competitive advantage, as well as our courtesy delivery service. One Owner, Dealer Warranty, NAV-Capable! See Dealer for Details, 17" x 7" Aluminum Wheels, 9 Amplified Speakers w/Subwoofer, Comfort & Sound Group, Power 4-Way Driver Lumbar Adjust, Power 8-Way Driver Seat, Quick Order Package 25J, Tonneau Cover. Clean CARFAX. CARFAX One-Owner. Certified. Bright White Clearcoat 2017 Jeep Cherokee Latitude 4WD 9-Speed Automatic 2.4L 4-Cylinder SMPI SOHC $1000 price protection guarantee, Tri City serving greensboro, burlington, martinsville, danville and surrounding areas. Warranty on every used car in stock. Recent Arrival! Odometer is 2714 miles below market average! Chrysler Group Certified Pre-Owned Details: * Includes First Day Rental, Car Rental Allowance, and Trip Interruption Benefits * 125 Point Inspection * Vehicle History * Transferable Warranty * Limited Warranty: 3 Month/3,000 Mile (whichever comes first) after new car warranty expires or from certified purchase date * Roadside Assistance * Warranty Deductible: $100 * Powertrain Limited Warranty: 84 Month/100,000 Mile (whichever comes first) from original in-service date Awards: * 2017 KBB.com 10 Most Awarded Brands Tri City proudly serving Martinsville, Danville, Greensboro, Burlington, Winston Salem, Kernersville. We have the $1000 price protection guarantee along with the lowest administrative fee in the area with zero hidden fees. Come check out our competitive advantage, as well as our courtesy delivery service. One Owner, Dealer Warranty, 1-YR SiriusXM Guardian Trial, 1-Yr SiriusXM Radio Service, 276 Watt Amplifier, 3.07 Rear Axle Ratio, 8.4" Touchscreen Display, Anti-Lock 4-Wheel Disc Performance Brakes, Apple CarPlay, Bright Pedals, Dodge Performance Pages, Door Trim Panel w/Ambient Lighting, Fog Lamps, For Details, Visit DriveUconnect.com, For More Info, Call 800-643-2112, Google Android Auto, GPS Antenna Input, HD Radio, Heated Front Seats, Heated Steering Wheel, Hectic Mesh Interior Accents, Integrated Center Stack Radio, Leather Trim Seats, Media Hub (2 USB, AUX), Nappa Leather Sport Seat, ParkSense Rear Park Assist System, ParkView Rear Back-Up Camera, Performance Steering, Power Tilt/Telescope Steering Column, Quick Order Package 21V SXT Plus, Radio: Uconnect 4C w/8.4" Display, Rear Bodycolor Spoiler, Shark Fin Antenna, SiriusXM Satellite Radio, Sport Suspension, Steering Wheel Mounted Shift Control, Super Track Pak, Universal Garage Door Opener, USB Host Flip, Ventilated Front Seats, Wheels: 20" x 8.0" Granite Crystal Aluminum. CARFAX One-Owner. Certified. Billet Clearcoat 2017 Dodge Challenger SXT Plus RWD 8-Speed Automatic 3.6L V6 24V VVT $1000 price protection guarantee, Tri City serving greensboro, burlington, martinsville, danville and surrounding areas. Warranty on every used car in stock. Recent Arrival! Odometer is 17521 miles below market average! 19/30 City/Highway MPG FCA US Certified Pre-Owned Details: * Warranty Deductible: $100 * Includes First Day Rental, Car Rental Allowance, and Trip Interruption Benefits * Vehicle History * Limited Warranty: 3 Month/3,000 Mile (whichever comes first) after new car warranty expires or from certified purchase date * Roadside Assistance * Powertrain Limited Warranty: 84 Month/100,000 Mile (whichever comes first) from original in-service date * 125 Point Inspection * Transferable Warranty Tri City proudly serving Martinsville, Danville, Greensboro, Burlington, Winston Salem, Kernersville. We have the $1000 price protection guarantee along with the lowest administrative fee in the area with zero hidden fees. Come check out our competitive advantage, as well as our courtesy delivery service. One Owner, Dealer Warranty, Quick Order Package 22H R/T, Trunklid Spoiler, Wheels: 20" x 8.0" Premium Painted Aluminum. Clean CARFAX. CARFAX One-Owner. Pitch Black Clearcoat 2016 Dodge Challenger R/T RWD Tremec 6-Speed Manual HEMI 5.7L V8 VVT $1000 price protection guarantee, Tri City serving greensboro, burlington, martinsville, danville and surrounding areas. Warranty on every used car in stock. Recent Arrival! Tri City proudly serving Martinsville, Danville, Greensboro, Burlington, Winston Salem, Kernersville. We have the $1000 price protection guarantee along with the lowest administrative fee in the area with zero hidden fees. Come check out our competitive advantage, as well as our courtesy delivery service. Dealer Warranty, Bronze Interior Accents, Dragon Exterior Badging, Bronze Jeep Swing Gate Badge, Bronze Jeep Grille Badge, Delete Sunrider Soft Top, Body Color 3-Piece Hard Top, 18X7.5 Alum Wheels w/Bronze Accent, Serialized Dash Plaque, 1-Year SIRIUSXM Traffic Service, 1-Year SIRIUSXM Travel Link Service, 40GB Hard Drive w/20GB Available, Connectivity Group, Integrated Voice Command w/Bluetooth, Navigation System, Radio: Uconnect 730N CD/DVD/MP3/HDD/NAV, Remote USB Port, SIRIUSXM Traffic, SIRIUSXM Travel Link, Tire Pressure Monitoring Display, Uconnect Voice Command w/Bluetooth, Vehicle Information Center. Black Clearcoat 2014 Jeep Wrangler Unlimited Sahara Dragon Package 4WD 5-Speed Automatic 3.6L V6 24V VVT $1000 price protection guarantee, Tri City serving greensboro, burlington, martinsville, danville and surrounding areas. Warranty on every used car in stock. Recent Arrival! Tri City proudly serving Martinsville, Danville, Greensboro, Burlington, Winston Salem, Kernersville. We have the $1000 price protection guarantee along with the lowest administrative fee in the area with zero hidden fees. Come check out our competitive advantage, as well as our courtesy delivery service.